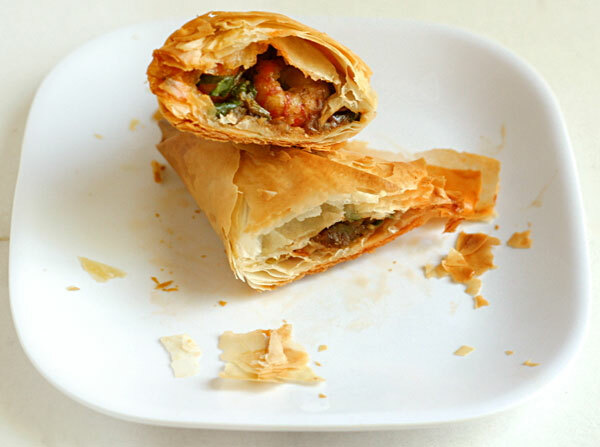 Crawfish Phyllo Triangles is a great crawfish recipe that I wanted to share with you. This recipe would be perfect to use with left-over crawfish from a crawfish boil. 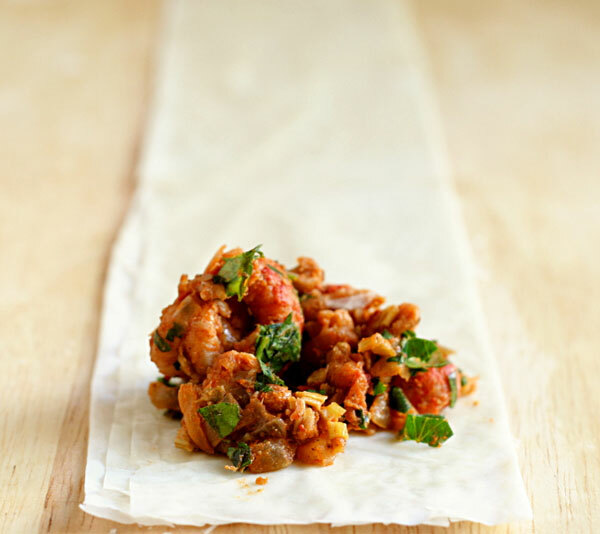 Spicy leftover crawfish tails are wonderful in recipes because they add a rich layer of seasoning and spice. In addition to the the crawfish, you could add in leftover andouille sausage or onions from the crawfish boil. C'est bon! Doesn't the crawfish filling look yummy? The food photography is beautiful. Thank you to the food blog, The Way The Cookie Crumbles for sharing the wonderful photograph and tutorial for this recipe. I made a few changes to this recipe, adding in some creole seasonings. Here is my Louisiana version of this Crawfish appetizer recipe. Both versions are adapted from Emeril Lagasse's, Cocktail Crawfish Turnovers. Make filling: Heat the butter in a skillet over medium-high heat. Saute the onions, bell peppers, and celery in the butter. Season with creole seasoning. Cook, stirring, until the vegetables are slightly soft, about 2 minutes. Add the garlic and cook for about 30 seconds. Add the flour and stir until the mixture is lightly golden, about 3 minutes. Add the milk, and continue stirring until the mixture is smooth, about 3 minutes. Turn off the heat. Add the crawfish tails, cheese, green onions, and parsley. Stir to mix well. Remove from the heat and let cool to room temperature. Phyllo dough. To make each crawfish appetizer triangle, set one sheet of phyllo on a clean lightly floured work surface and brush melted butter on half of the sheet lengthwise. Fold the phyllo on its long axis in half. Brush melted butter on half of the phyllo lengthwise again, and fold on the long axis once more. You should have a long narrow strip of phyllo with 4 layers. Triangle Filing. Place a tablespoon of crawfish filling on the bottom corner of the strip and begin folding the dough over the filling. Continue folding until the dough is completely wrapped around the filling. Brush a little butter on the end to seal it down. Repeat with remaining phyllo and filling. Brush the top of each crawfish triangle with egg yolk for a pretty shine when baked. BAKE. Line a baking sheet with aluminum foil or parchment paper. Place the triangles about 1- inch apart on the sheet and bake until golden, 12 to 15 minutes. Remove from the oven and let cool for 5 minutes before serving. Makes about 24 triangles. Crawfish Cooking Tip- When cooking with crawfish tails- brighten up the flavor by tossing the crawfish tails in a splash of fresh lemon juice before you add them to a recipe.